The dining room isn’t exactly awe-inspiring, but it’s comfy and warm, with a combination of blue painted walls and exposed brick on the walls, the old-world charm of well-worn tables and an airy front kitchen. I wonder if that’s why they call this place, Osteria, Real blue? Anyway, apart from the unorthodox deco, the message I would like to get across is that Osteria, is really, a diamond in the rough. You would never know that such an amazing little restaurant was there unless you walked in and ate there. I mean, I myself actually walked by many times and struck it off altogether because I did not realize what lay beyond that brick wall. This place is owned by a husband and wife team, the husband being the Chef and the wife being the boss of the place. 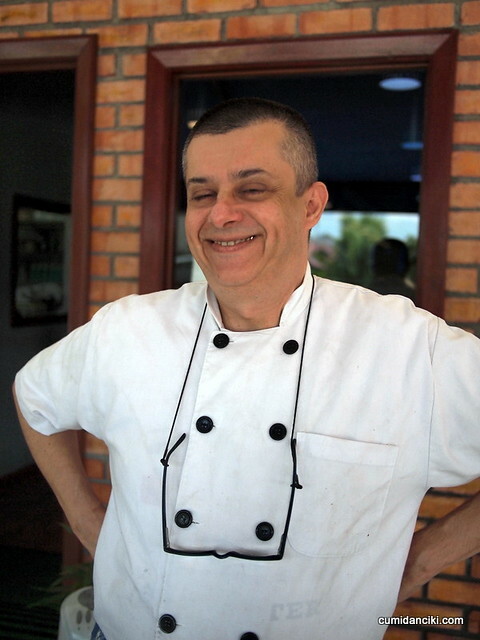 Chef Mirko jokes to us about this and you can tell he really is, a rather shy guy with endearing, smiling eyes. I already knew I was in good hands. The menu is crammed with dishes and I am guessing, most of them could be signatures, and while prices are moderate, the generosity is evident. What’s even more interesting is what’s not on the menu. Ask the Chef for the specials if you want to take a walk on the wild side. We wasted no time ordering our lunch. The crespelle is an Italian version of a crepe. Here at Osteria, the delicate golden crespelle was served to us, pipping hot, filled with ricotta, a scattering of parmigiano-reggiano and herbs, covered in a fluffy mountain of black truffle shavings. The aroma was to die for. Never have I devoured what’s placed in front of me with such gusto. My dining companion says this is what I save up all my carbohydrate points for. No kidding. This should carry me well in to March. Yes, the crespelle really found a small place in my heart. I swear the crespelle is a one-course meal.. a huge salad and a crespelle and I’d be good to go. Introducing, the Pancetta Risotto. This is not on the menu. Please ask the Chef. What can I tell you about this risotto except that it had a wonderful textbook texture.. the elusive sweet spot between gloppy and soupy. 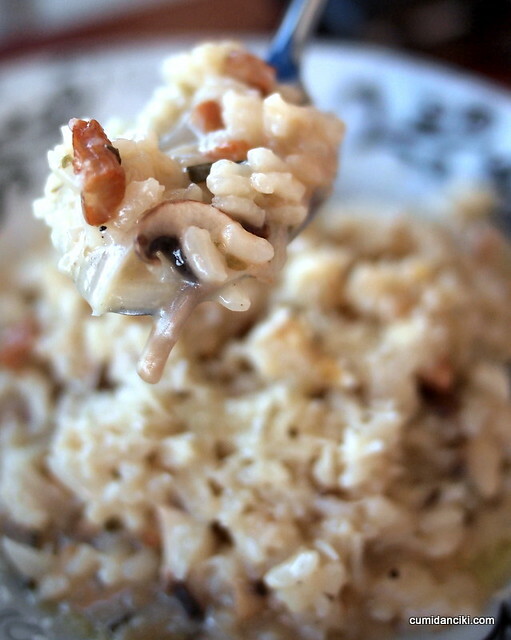 This risotto is notable because it contains sufficient quantities of fat and is finished with a generous amount of ham and mushrooms, which heightens both color and flavor. The grains are plump and well formed, mixed into that creamy brothiness that can only be described as rapturously tasty. I’m no expert but, definitely one of the best risotto’s I’ve ever come across in a long time. Gorgeous as hell. 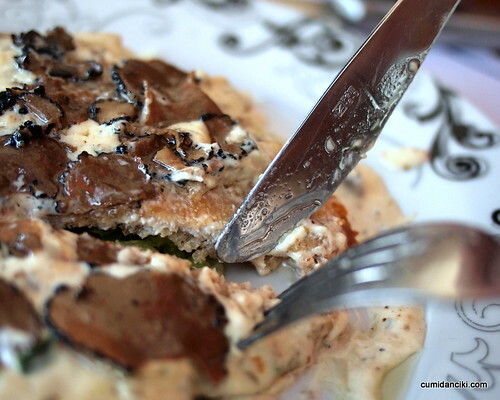 This is the cotolletta al tartufo. Essentially a deep fried pork chop topped with cheese, ham and truffle. Possessing a chewy texture without being hard, this thin slice of pork was yet another winner. I am beginning to feel like this place can do no wrong. 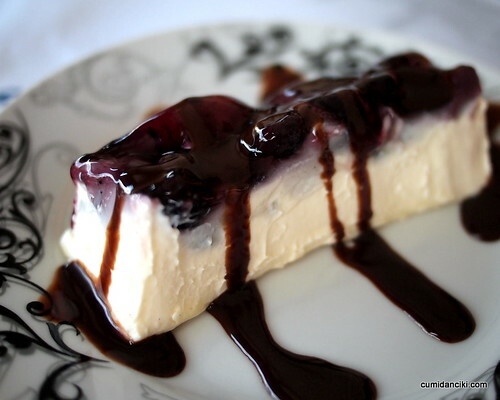 The Panna Cotta here is creamy and dense, served with a generous topping of blueberries and some chocolate sauce and it all melts together in a happy progression on the tongue. It’s the perfect dessert for today as we sit in the afternoon heat. Also the perfect antidote for a bellyful of risotto and etc. etc. Well, not really, but I’m just saying. It’s perfect. A super eggy creme brulee topped off with so much alcohol I could light a torch with my breath and a match, this was another heavenly dessert. The custard was smooth and round on the palate, not pasty nor oversweet, and baked in a saucer shallow enough for you to get a proper balance of crunch and cream with each bite. Great for Creme brulee fans. The perfect end to a great meal. My advice is, don’t wait too long to pay this place a visit. oi! you said you were going to work hard all week.. naughty girl! The Panna Cotta …mmmmm yummy looking! u got me craving for some italian food!! 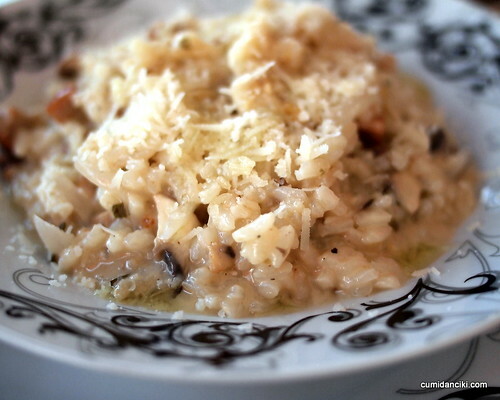 The risotto looks like to-die-for! Ah.. gorgeous as hell indeed! ooh, thanks for the reminder about this place! i actually still recall having my first dinner with boo here in january 2010 (though so far, it has been our only dinner together!). Oops, reminder to dig out pixs and post this soon as I lurve their risotto! Lovely pixs as usual Babe. That panna cotta is killing me! It is calling my name, it is following me down dark alleys! Hi Josh! 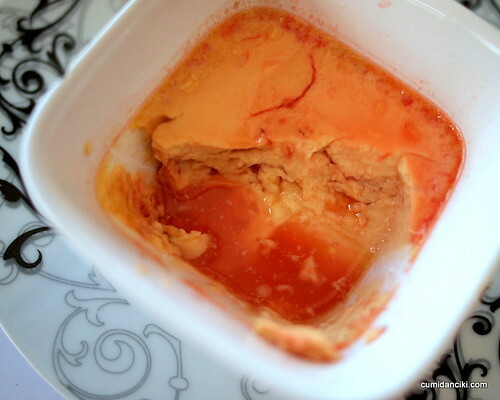 that’s my all time fav italian dessert… this place does it perfect i tell you! 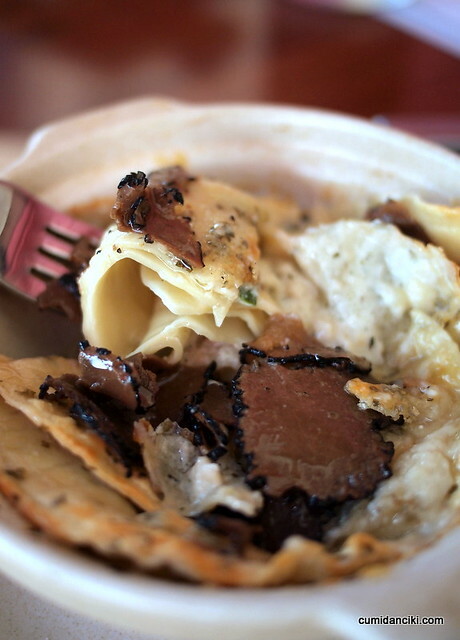 So do they use real truffle in Crespelle al Formaggio e tartufo or truffle flavoring? Was reading about that sort of thing the other day. well, you see the black shavings? those ARE real life truffles.. MWUAHAHA! Oh btw, can u pls remove the “blogspot” from my url in your blogroll? Thanks a lot ya, babe! Really? I thought you LOVED risotto! been there once. though not an italian food fan, must admit the food there is rather impressive. service is great too. I am going there this Saturday! Highly recommended by a friend of mine. OMG Italian Food here i come!